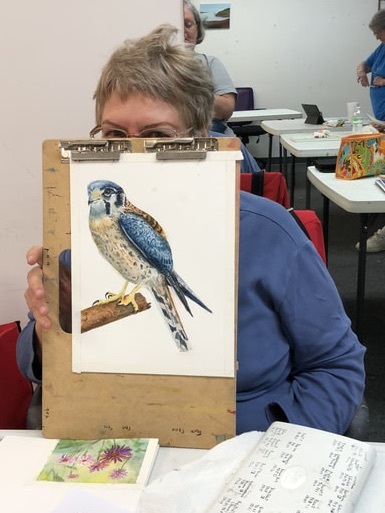 Member Challenge 2019: "Bird is the Word"
Every year, JRAL creates an art challenge for members, and members share their results with the League in one of our meetings, with a guest artist to critique and comment on the art presented. We thank member Jan Murray for suggesting this year’s Artist Challenge theme: JRAL members are invited to paint anything to do with birds or the word ‘bird.’ You could paint a lovely picture of a bird, either factual or fantastical. Or paint Cardinals in ecclesiastic robes, a Toronto Blue-Jay mascot, or even a prehistoric ‘Terry-dactyl’ who resembles our JRAL Treasurer. Perhaps you’ll want to paint a British ‘Bird’ or American ‘Chick’, nicknames for young unattached females, or maybe portray a golfer putting for a birdie. Or an entire Murder of Crows or Gulp of Cormorants. You could even spin the sound of the word ‘bird’ and paint a ‘brrrr’d’ winter scene, or a ‘burred’ rough textured surface. Don’t be chicken…the possibilities are endless! The Artist Challenge presentations will be April 19; review and critiques will be provided by Robert Caldwell, a nationally recognized and published wildlife artist who lives in Richmond. Learn more about Robert at his website www.rlcaldwell.com. The theme for JRAL’s annual Artist Challenge was “Love Connection” and was held on April 20th, 2018. "Love Connection” is the connection that one person has for another person, for an animal, flower, book, or for anything that brings joy to your life. Our members each created their own expression of the theme. Our guest critique artist was Thomas Bradshaw. Bradshaw is a nationally renowned impressionist artist and teaches a mixed media class at For Art’s Sake. He has opened his own Gallery in Blackstone, VA. Click here to learn more about Thomas Bradshaw. “Reflections” was the theme of the 2016-17 JRAL Artists Challenge. It is one of the themes suggested in our 2014 members’ survey, and it provides members with the opportunity to interpret the concept of “reflections” anyway we like, be it literal, symbolic, meditative, or metaphysical. Peggy Davis, Richmond artist and art instructor, was our judge for the challenge. "What does Love look like? How about Joy? Anger? Serenity? Regret? If you could paint an emotion, how would you do that? Well, now’s the time to find out! “Emotions” is the theme of JRAL’s 2016 Artist Challenge, as we learn to channel our Inner Expressionist. Portray one or a roller coaster of emotions! Paint/create in any medium you like, in a realistic or abstract style — use whatever you feel best represents the emotion(s) you hope to portray and/or invoke." The 2015 Member Challenge was to explore an important aspect of the artistic process -- painting with complementary colors. Our members rose to the challenge and presented a wide array of art pieces focused on this aspect. ​Adele Castillo, artist and instructor, delivered a thorough critique of our members' art work. The 2014 Member Challenge was to create a piece of art (painting, drawing, collage, etc.) with the focal point being HATS. Dozens of members threw their hats into the challenge, culminating with a show and critique at our May 16th meeting. Artist and instructor Christopher Wynn delivered the lively critique, commenting that "There are a lot of talented people in this organization!" The 2012-13 Member Challenge was called the "River City" Challenge. The goal was to produce a piece of art that truly speaks of Richmond. Art works from this challenge were exhibited at our 50th Anniversary Exhibit Celebration at Crossroads Art Center in March 2014. We had a wonderful turnout for this member challenge, and many thanks to Christopher Wynn, who gave insightful and helpful critiques for the works. The 2012 challenge was to reproduce, translate or expand upon a famous piece of art. The turnout and member entries were spectacular. Thank you to Sally Bowring, who provided critiques of many of the works. Janice Clark was the winner of the People's Choice award, with her inspiration from Andy Warhol. Thank you, members, for your participation!